Renovating any landscape or development area can often lead to many tough decisions – how to make the best choice between sod, seed or hydroseed is usually one of them. Below is a breakdown a few things to take into consideration because each project has different factors that come into play. There are price gaps depending on the size of the job and equipment/material prices and availability. Typically, sod is the most expensive option, costing customers between $6,000 and $10,000 for about an acre, due to high material and labor costs. The middle-ground option is hydroseed, and depending on the mix of the materials, it can cost a customer about $2,500 to $6,500 an acre. The application isn’t as labor intensive, but additional costs like finding skilled or licensed hydroseed technicians can cause the price to be higher. Also, hydroseeding usually isn’t an option for small jobs. Seed is typically cheapest, costing a customer from $1,000 to $5,000 per acre. Access to the proper tools is another major factor. Do you own or would you need to rent the equipment for the various installation methods? If you’re laying sod by hand, transporting sod pallets requires a skid-steer. Laying large rolls of sod mechanically is often the most efficient method, though it requires a “big roll” attachment on a tractor or skid-steer. Hydroseeding requires specific, heavy-duty equipment, including a retrofitted truck and a skilled crew to operate the equipment. Most companies revert to renting it or subcontracting the service. Seeding requires the least equipment and skill—a small push spreader can work depending on the size of the property or specialized equipment like a slit seeder may be beneficial for larger projects. Contractors call sod “instant green” because it looks great the day it’s laid and provides instant gratification. Its fast-fix nature makes it perfect for commercial customers, like campus or property managers, with money to spend. But, sod requires upkeep and a good irrigation system or else the sod will die quickly. Seed can take four to five weeks before it begins to sprout. Many contractors prefer seed for longevity, suggesting it for homeowners who are less concerned with immediacy and want lasting results. Hydroseed typically takes as long to sprout as seed, however, its quick, efficient application is fit for large-scale properties, like fields or roadside turf, but it may be overkill in a backyard. 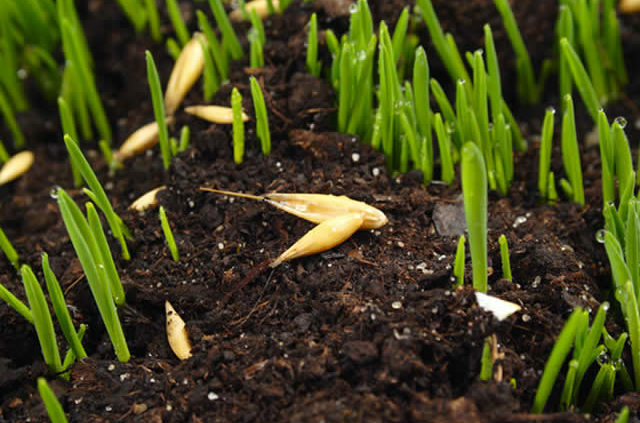 Regardless of the installation method, the soil and water determine the success of a property. Prior to planting, it’s important to do a soil test. 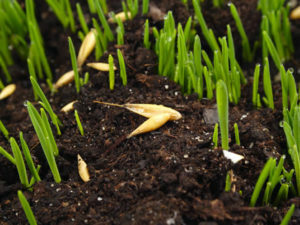 Lack of quality soil is often a detriment to new homes’ lawns or any property that has had issues with growing grasses. The test reveals what nutrients are lacking in the soil profile. While applying fertilizers may provide a temporary fix, it is important to get organics back into the soil. Here is a product line that can ensure healthy soil.